"I felt like it wasn't meant to be. It was like my body failed me, and that I couldn't do what I was meant to do. I felt an emptiness inside myself and my heart that could never be filled," said Stephanie Epolite in a television interview. After two failed ICSI/IVF cycles, NaProTechnology helped her to achieve a pregnancy and give birth to her daughter. 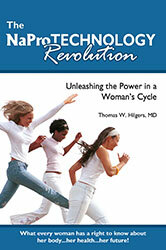 The NaProTechnlogy Revolution: Unleashing the Power in a Woman's Cycle is a book about finding real solutions to real problems — problems such as infertility, menstrual cramps, PMS, ovarian cysts, irregular/abnormal bleeding, polycystic ovarian disease, repetitive miscarriage, postpartum depression, prematurity prevention, hormonal abnormalities, chronic discharges, and family planning. The new women's health science of NaProTechnology is based on the Creighton Model FertilityCare™ System, which is a natural fertility tracking that generates standardized information about women's reproductive health and enables couples to achieve or avoid pregnancy effectively. It is the only system that can be used with NaProTechnology to help diagnose and treat reproductive health problems. NaProTechnology (or natural procreative technology) uses the Creighon Model System to help a woman reach her optimal state of reproductive health. Its medical and surgical approaches, developed over decades of research and now emerging in peer-reviewd medical literature, achieve real solutions to real problems that face women and couples. NaProTechnology is what every woman has a right to know about her body … her health … her future! Protects your baby's health: NaProTechnology Prematurity Prevention Program cuts the rate from the national 12.7% to 7%!